Area :1760 sq.ft - 3600 sq.ft. With over a decade of expertise in urban development Phoenix Mills is one of India’s leading developers of mega retail malls, entertainment complexes, commercial, residential and hospitality spaces. Our renowned Palladium, High Street Phoenix and Phoenix MarketCity malls across Mumbai, Pune, and Bangalore have redefined the retail shopping experience. Having raised the standard for shopping and entertainment hubs across the nation, the Phoenix Mills legacy of experience now has made its foray into Bangalore’s residential realm with ONE BANGALORE WEST.Other Residential Developments by Phoenix Mills include The Crest, Luxury residences in Chennai and Fountainhead in Pune and Kessaku, the uber luxury Development at Bangalore.. ONE BANGALORE WEST is located in an equally premium location, No. 1, Dr Rajkumar Road, opposite to the Sheraton Hotel and the World Trade Centre at the cusp of Malleswaram and Rajajinagar With the sprawling ISKCON complex serving as a breathtaking backdrop ONE BANGALORE WEST is sure to take your breath away. Location : The location, No.1 Dr Rajkumar Road is in the heart of the city. With the Sheraton, World Trade Centre, Bangalore, the Sheraton and the Orion Mall opposite the development, access to World Class Commercial, Retail and Hospitality is a stone’s throw away. The location is at the cusp of Bangalore’s most prestigious localities Rajajinagar and Malleswaram and a short drive away from Palace Orchards. The infrastructure improvements in the surroundings make access to the City and the Airport seamless. The verdant greenery of the ISKCON complex adds a soothing backdrop to the development. Healthcare at Columbia Asia is a doorstep away. The Metro Station , 400 mts away offers seamless connectivity to the rest of Bangalore and access to the Airport though the IIsc underpass and the the Expressway is a pleasurable 40 minute drive. Planning : One Bangalore West has seen the best names in the industry come together to create a living environment that would be the perfect setting to live well. The Architects Benoy (UK) and the RSP (Singapore) are amongst the most reputed worldwide. The Landscape Architects Designcell are known for their exceptional expertise in creating of unique aesthetic spaces. One Bangalore West has over 80% landscaped lung space with building coverage of under 20% and a 50,000 sq. 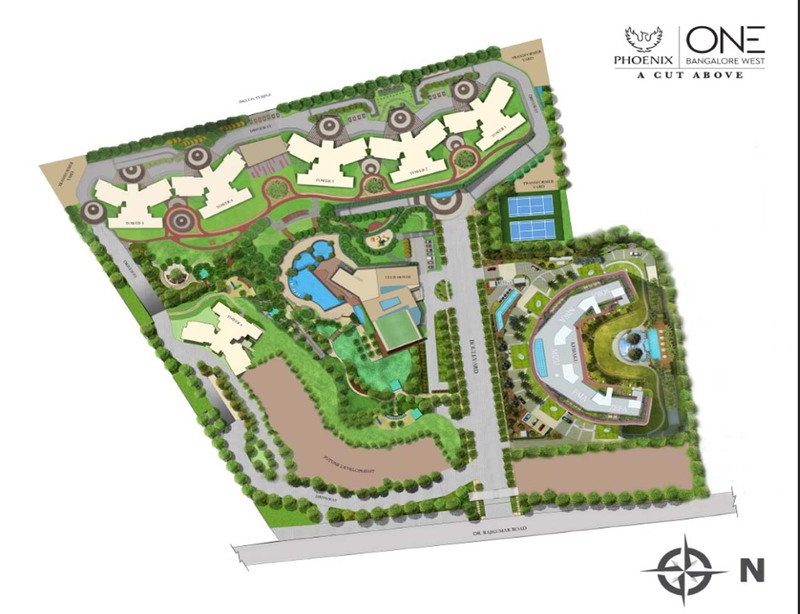 ft clubhouse exclusively for use of the residents of the complex and houses some of the best amenities and recreational spaces ensuring when you live well, you live healthy and relaxed. What the rest of Bangalore calls a resort, you will call home. Project Features : Hi -Rise 30 storey towers offering panoramic vistas ,with particular emphasis to safety features whether being seismic compliant or fire safety guidelines, at OBW we have gone the extra mile in providing for the same. Areas ranging between 1760 sq.ft. for 2-bed homes with family area to 3600 sq.ft. 4-bed homes with family and study. Carefully planned with attention to detail and impeccably finished to exacting quality standards.